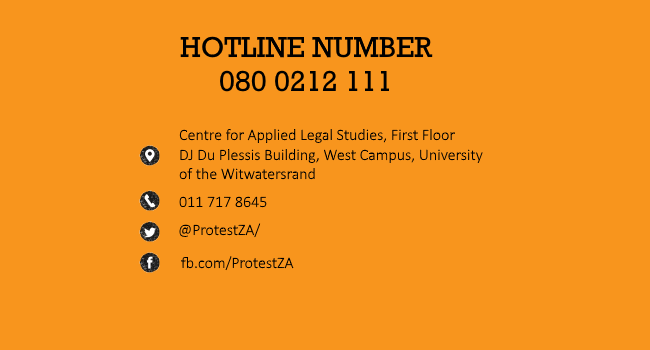 This case is an appeal brought against the magistrate who refused to grant Bonginkosi Gift Khanyile bail pending his trial for his involvement in the Fees Must Fall campaign at the Durban University of Technology. Bonginkosi was granted bail in March 2017 after spending 6 months in prison. The above case is an appeal brought against the Regional Court sitting in Bloemfontein. 94 appellants had been convicted of contravening section 12(1)(e) of the Regulation of Gatherings Act, 205 of 1995. The appellants were given a suspended sentence of a R600,00 fine or three months imprisonment. The appeal succeeded and the conviction was set aside. The Minister of Police was ordered to pay the wasted costs occasioned by the postponement of the matter on June 20 2016.